My Nana would have been the amazing age of 100 today had she still been alive, she always did want to live until she was 100 and get her letter from the Queen. But, sadly she passed away almost twelve years ago now, shortly followed by my Grandad. 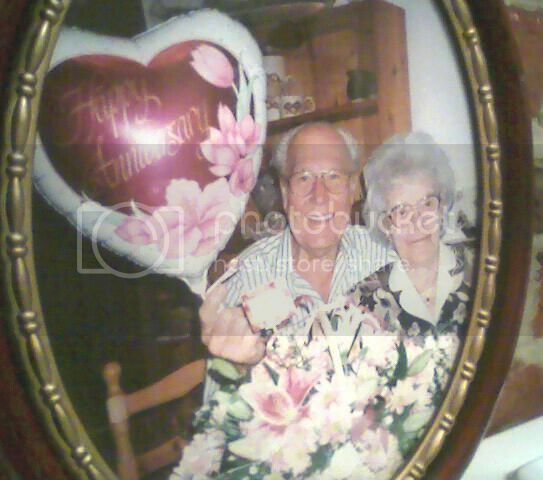 This photo was taken when they were both still in good health on one of their wedding anniversaries, I cant remember for certain but I think it was either their 50th or 55th, I remember shortly after this photo was taken my brother gave them green edible underwear. They thought it was hilarious, Mum, not so much! My Nana taught me how to knit when I was little, she patiently helped me make a pink tea cosy for my little china tea pot, I still have it somewhere packed away in a memory box. She was a wonderful knitter. I am a child of the '80s and was gifted with many knitted jumpers, one with Thomas the Tank Engine on it, and many more, usually every Christmas. She would also knit for my Grandad the most wonderful Cable or Aran knitted jumpers, Mum still has a few that she cant bear to part with so I suggested with turn them into cushion covers at some point. Sadly I forgot how to knit very quickly, I found cross stitch instead and that was easier for me. But it did not stop me looking through all of the wool and helping her wind the yarn. When I was doing my MA I decided that I wanted to take up knitting again but unfortunately, about 6 months before, Mum had given away my Nana's knitting needles, she, nor I, never expected me to want to learn again. But even though I dont have her needles I still think of her as I knit, I can picture her in her arm chair with the big ball of wool beside her clacking away at something or other. Something we do have is her beautiful treadle sewing machine, neither Mum nor I have braved using it yet, it sits in my parents bedroom under the pile of ironing as it is in a cabinet, one day though I am sure we will give it a spin. We also have the "Button Tin". There are hundreds of them! My Grandad was a keen gardener, he loved to potter about in his greenhouse in his green coat and flat cap and I am now just starting to get an interest in gardening and I often think of him. I am glad that I can feel both of their influence on me and my skills, I may not be able to knit Thomas the Tank Engine, but I can feel Nana's hands over mine on my little plastic yellow knitting needles guiding me on my stitches and for that, I am thankful. Happy Birthday Nana, enjoy your Birthday dance with Grandad, wherever you both are.